I've positively reviewed tube amps that sounded wonderful to me, then performed poorly on JA's test bench. It was like having my pants pulled down in front of a large crowd of people. 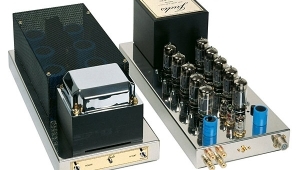 But Lamm Industries' impressive track record of measurements as published in Stereophile gives me confidence that this time my pants will stay upeven if low-powered, single-ended-triode (SET) amplifiers such as the ML3 Signature usually fare even worse than their push-pull relatives. "Are you a technical person?" That's what Vladimir Lamm, a Russian ÇmigrÇ and former rocket scientist, asked me as I prepared for this review. I told him that, yes, I am technically a person, but when it comes to amplifier circuitry, I am more conceptual than technical, and that I think that also describes most Stereophile readers. So, conceptually, here's what you need to know about the ML3 Signature. 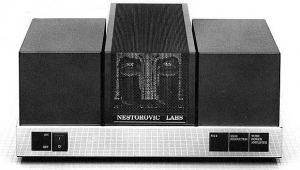 It is a zero-global-feedback, single-ended-triode, class-A (meaning that a constant voltage, or bias, is applied to the tube's grid) monoblock amplifier. 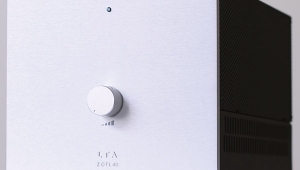 Although Lamm feels that using feedback is merely a Band-Aid, the ML3 does have two switches, offering 1.2dB and 2.4dB of negative feedback. These affect only the output stage, and serve to lower the output impedance. They're there, Lamm admits, just so you can hear for yourself how using feedback degrades the sound. 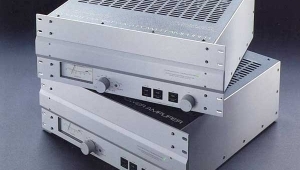 Vladimir Lamm's ML3 Signature monoblock amplifier with ML3-PS power supply is unlikely to win any awards for its industrial designor lack thereof. If you like 1930s-style "lab-grade" basic black, you'll love their looks. I do. They look like something from Victor Frankenstein's laboratory. Each chassis weighs about 80 lbs and measures 15.8" wide by 8.2" high by 20.2" deepthe four of them occupy a lot of floor space. Chances are, if you can spend $139,490yes, that's the pricefor a pair of 32W SET amps, you've got the space. As with any product with exposed vacuum tubes, use caution if you have kids, animals, or anything hanging above or on adjacent shelves. The design of the ML3 centers around the care and feeding of its single, direct-heated (like a light bulb), GM-70 triode transmitter tube claimed to continuously output an unusually healthy (for a SET) 32W, up to a maximum of 37W. 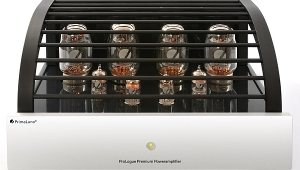 The ML3's other tubes are a single 12AX7/ECC83 and four dual-triode 6N30P-DR, each matched to its socket. At the chassis rear, behind the tubes, sit two formidable transformer cases. Among other premium components, the ML3's internal parts include military-grade Dale metal-film resistors; Caddock power-film resistors; Cornell-Dubilier and United Chemi-Con electrolytic capacitors; and Electrocube, Elcon, and Roederstein film caps. Connectors are gold-plated Neutriks and Fischers. Double sets of biwirable speaker terminals for each of the three transformer output taps (4, 8, and 16 ohms) line up along the amplifier chassis rear. Lamm claims the ML3 delivers its full 32W output from all of these taps into matching loads. 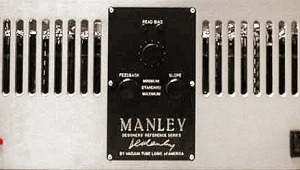 The input is single-ended RCA with a "utility" XLR connection included for convenience. 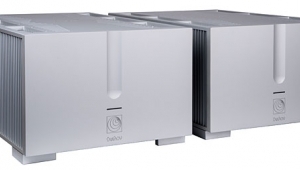 The ML3 is fed by an enormous outboard power supply, the ML3-PS. Lined up across the front top of the ML3-PS are six 12AX3 rectifier tubes; behind them are four big transformer cases, though rapping each of these with a knuckle indicated that only one is completely occupied. The ML3-PS has separate plate and filament transformers, the latter located in the ML3 chassis, six filter chokes, and, in the high-voltage power supply feeding the output stage, the "highest quality" film capacitors. The ML3-PS is connected to the ML3 via a multi-pin umbilical. Considering the price, all of that is the least you should expect. 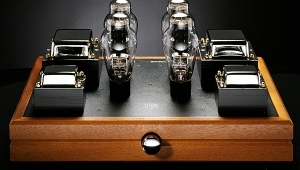 But more important than any of it are the custom-wound output transformers that are key to any tube amp's ultimate sonic and measured performances, and especially for a SET. 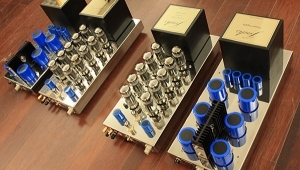 Those transformers are any tube amp's "special sauce," and among its most costly elements. The ML3-PS's plate, filament, and output transformers, all also custom wound, are mechanically isolated from both the transformer cover and the chassis, and suspended within a special vibration-absorbing material. Even with its relatively healthy (for a SET) output, the ML3 must be paired with a sensitive speaker with a relatively benign impedance curve. I heard two ML3s driving Wilson Audio Specialties MAXX 3 speakers in a large hotel room at a Consumer Electronics Show, and came away less than impressed. The sound was anemic and lacked dynamic drive and slam, though tonally it was mesmerizingly lush and smooth. Now that I've got a pair of Wilson's 92.6dB-sensitive Alexandria XLFs (I reviewed them in the January 2013 issue), I felt it was appropriate to review the ML3 with them, and even though I'm not a technical person, Lamm agreed. As JA pointed out in his measurements of the XLF, "Despite the Alexandria's imposing bulk, it will play at high levels with only a few watts. (During the in-room measurements, performed at a reasonably loud level, the darTZeel [NHB-458] amplifiers' meters never indicated more than 5W peak.). . . . [T]he speaker will not be a difficult load for the partnering amplifier to drive." 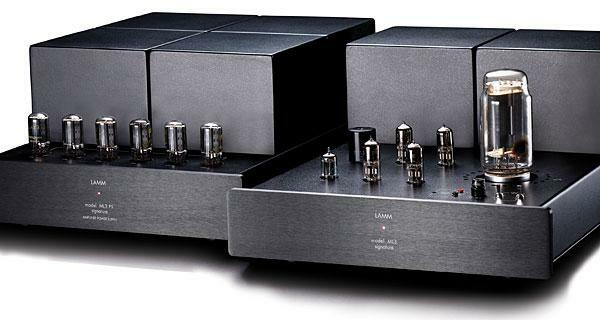 Setting up the amps was easy, and Lamm makes it convenient to measure the output-tube bias, which is specified at 1.1V DCbut for $140k, he probably should supply a good voltmeter instead of an electronic parts catalog showing a good one to buy! I've got a good one, and out of the box, the bias of both amps was correctly set at 1.1V. Over the course of the review it eventually dipped to 1V for both amps and had to be rebiased, but otherwise, the ML3s presented no problems and needed no maintenance. Lamm suggests replacing the 12 half-wave rectifier tubes in the ML3-PS every 18 to 24 months (about $120 total) and the ML3s' GM-70s every 18 months. He doesn't specify the cost of a matched set from Lamm Industries, but again, if you're spending this much for a pair of amps, you're probably not all that concerned. The Stage Is Set for Sound! But first, some perspective. I sat a few months ago with my wife, Art Dudley and his wife and daughter, and some others in the rooftop ballroom of Manhattan's St. Regis Hotel, where we were treated to the Emerson String Quartet and an additional cellist performing Schubert's Quintet in C Major, D.956. The acoustics were excellent, and our table was close to the stage. As I listened, I tried to analyze the differences between what I was hearing and the sound of the best string-quartet recording I've got. First, anyone who tells you that the sound of any audio system even approaches what you hear when you're in a room in which musicians are playing is fooling themselves and you. (Of course, we like to be fooled.) The dimensional and spatial cues on recordings are wrong. Attacks in even the best recordings are ham-fisted and lack textural grace and complexity. Dynamics, particularly microdynamics, are stifled, and harmonics are either shortchanged or overemphasized. So no matter what, you're not going to get "live" sound at home. The best solid-state amps always measure better than the best tube amps, produce greater transient speed and clarity, and generally produce far greater dynamic contrasts, and superior bass extension and control. Generally, solid-state amps deliver levels of transparency that few, if any, tube amps can manage. 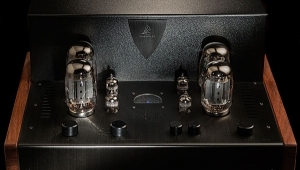 However, compared to the best tube designs, even the best solid-state amps produce an overhyped transient attack not heard live and can sound harmonically drab. And often, solid-state's superior transparency is accompanied by an analytical and "crunchy" sonic aftertaste, with the leading edges dominating, and the harmonic envelope licked and closed. Tube amps, on the other hand, are generally harmonically overripe, sound richer than life, slower and softer than life on transients, and lack solid control on the bottom. They tend to be noisier, bloomier, and "soggier" than life. So where did the Lamm ML3 fall? In some ways, predictably within the aforementioned tube parameters, and in some ways well outside them, in a realm of its own. Thus, when it comes to gushing about the ML3's sound, count me in-within limits. Yes, the ML3 sounded lusher and bloomier than life, with a midrange that almost landed in my lap, but it never failed to create a warm sensation in my chest that flowed up to the brain and lingered there for as long as the tubes glowed. And while the ML3 erred slightly on the side of bloom, it did so while also presenting the most transparent and open midrange I've ever heard from a tube ampmidband richness and transparency, produced in large part because this amp, despite its midband richness, was notably quiet. Most startling, though, was the ML3s' effortlessly clean and airy high-frequency extension. The Lamms were ruthlessly revealing of differences among speaker cableseven The Pathetic Randi would hear them. Choose the wrong cable and the amp could sound hard and brightor slightly clogged in the upper midrange and meager and overdamped on bottom. Choose the right cable, and it was smooth sailing from top to bottom. Speaking of bottom, the ML3 may not have had solid-state's fast, lean low-end attack, which is needed for the correct reproduction of amplified bass, but the extension was there and attacks were fast, clean, and nimble enough to produce a more-than-adequate foundation for even hard rock. Not the best there is, but better than expected. 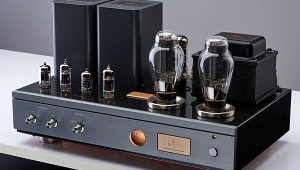 While the ML3 produced the rich harmonic palette expected from tubes, the naturalness of its portrayal of instrumental attacks put it as close to what I heard in the St. Regis ballroom as I've heard from any amplifier. The familiar vinyl editions of Bill Evans's Waltz for Debby (45rpm LPs, Riverside/Analogue Productions 9) and Live at the Village Vanguard (45rpm LPs, Analogue Productions) produced floor-to-ceiling, wall-to-wall spaciousness, and in that space appeared convincingly three-dimensional images of instruments that weren't tubey or diffuse. With the right speaker cablesin this case, David Salz's latest, the Wireworld Platinum Eclipse 7the late Paul Motian's shimmering, ringing cymbals sounded neither tube soft nor solid-state hard. Scott LaFaro's double bass sounded as nimble and natural as I've heard from these records. The attack, sustain, and decay of all three instruments was as graceful and lifelike as I've ever heard them, particularly the generosity of the sustain, which created (just so you don't think I'm getting carried away) an admittedly somewhat impoverished version of the floating, lifting sensation you hear live. 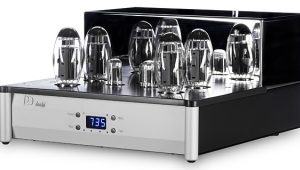 For some reason these amps really piqued my interest when they came out (always been a fan of the laboratory aesthetic), but I could find little in the way of a review other than show reports. What really made my day was to find Jansch and Renbourn were used for the review; always nice to match the calibre of the music with the system! $140,000 in order to get stock metal boxes, no significantly special rare component, basic cabling inside, that ultimately will bring "more-than-adequate" bass and yet will be able to ruthlessly discriminate between speakers cables, speed light % or whatever. And we're warned it's nowhere near the real thing... despite its muscular 32w feeding $200,000 average 92dB/w/m sensitivity speakers! Who would have guessed? At this rate, it'll be cheaper to buy a lifetime of live concert tickets and live forever after with the memory of these performances! It's all too easy for someone to carp from the sidelines, and yes, these amplifiers are silly-priced. But until you have actually listened to them driving the Wilson speakers, as Michael and I have done, your opinion is meaningless. You said it. So why don't you provide information such as the real cost of designing and building one unit and a thorough investigation to what should be the price as a result since you acknowledge the present price is silly? Nothing in this open chassis suggests anything special in manufacturing or parts. A set of bulbs at about $120 is rather mundane... That this amp would sound good is the least this stuff can do! But what is also too easy is to flog outrageous priced product and what amounts to a large slack on the technical level (euphemism such as more-than-adequate, in spite of bloomier, less than that attacks etc... when elsewhere you are counting the 0.0001%) given to this product as an argument of authority. Information over promote. I meant "silly" as in super-expensive, not that the price was out of proportion to its manufacturing cost or its sound quality. 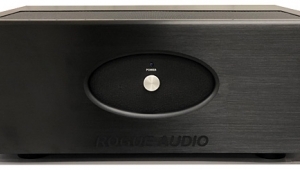 If you think this amplifier is over-priced, then please, do not buy it. P.S. : For instance, some expensive speaker manufacturer is billeting their enclosures from solid aluminum. I may not buy their product but I indeed appreciate the information and do understand the process would make their product more expensive than particule board kitchen cabinets. Do I make myself clear? 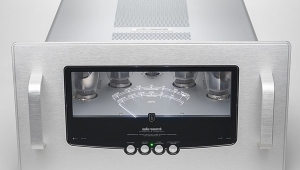 You know the difference between this power amplifier and a kitchen cabinet, but you're asking someone who's not at all involved with the design, manufacture, and marketing of this product to explain and apologize for its cost? No I am asking someone who supposedly offers a critical assessment of these products to offer information instead of arguments of authority. If it's to rehash the manufacturer's website, then what's the point? Where is the value to a potential buyer reading that stuff? "Are the transformers made of pure gold, the capacitances in platinum"
What's with the obsession over the cost of the components? Who cares what the cost of the components are? Are you planning to melt it down for scrap cost? It's like saying you wouldn't pay more for a camera lens that performs better (because of the optics design) if it wasn't made out of expensive fancy materials. Or, all chipsets/DSPs are just made out of the same materials, right, so who cares about firmware/software? The reviewer provided a critical, albeit subjective, review, along with objective measurements of the product performance. It's up to the buyer to decide whether that level of performance is worth the price. End of story. If you think another product is better at a lower price, don't buy it. I am asking someone who supposedly offers a critical assessment of these products to offer information instead of arguments of authority. I think you are reading a different review from what Stereophile published. 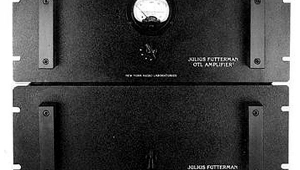 We described this amplifier, informed readers what it cost, discussed how it sounded, and offered a full set of measurements, along with its specifications and details of the system used to audition it. No, we didn't condemn it because of its very high price. 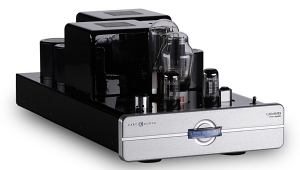 While that will restict total sales of the Lamm amplifier, that alone should not preclude recommendation. Michael sets up the typical audio ignorant straw man arguement at the outset of the article: "Unlike Video which has standards such as grey scale, tracking accuracy blah blah blah---Audio has NO standards and is simply whatever the mastering engineer prefers." Well, no. Actually this is totally wrong and part of the reason the High End is so full of horse puckey. Baloney about audio seems to permeate the Domestic "experts" and I for one would like for it stop and for domestic audio to start advancing once again leaving behind the snake oil and mystery which is so easily sold to the misinformed. There are in fact many standards employed by mastering engineers. Simply peruse the lastest coffe table marvel from Recording Architecture, a british audio firm which is leading the charge to standardise mix, mastering and post audio playback rooms. The list of audio qualities that they enclude in every project is as long as your arm. It is all designed to avoid the misery of old thinking---where every listening room had a different take on the balance and thus the hapless professional would go mad trying to find consistency in their work from one room to another. And from one playback type (Pro Audio) to another (Domestic Audio). Even a superficial investigation of the big shots of the mix world would immediately reveal their dedication to standardising domestic playback results. The playback accuracy attained by the world renown mix engineers is a direct result of the "correctness" of their studio playback equipment and rooms. It is in fact part of the reason these guys make the big bucks. Their stuff WORKS. Please go look on line at this subject. These guys work their butts off to make consistent standards of excellence which translate across the audio medium. There is a TON of stuff which audiophiles should be stealing in ideas from the masters in the recording industry. The pro guys use OUR stuff all the time. But thats just where they BEGIN. Their attention to setup is astonishing compared to the slap dash way most domestic audio is built as systems. Most top pros use better gear the YOU do Michael. Wilsons are nice but I have seen lots of pro rooms where just the room itself cost twenty times what your entire system costs. Apparently Michael has also been left out of the loop when it comes to the elaborate reference standards imposed on theater audio by THX. Mike should visit some of the elaborate designs that this industry builds in the determination to standardise playback fidelity to a high standard of excellence. Mix rooms may in some cases require the construction of actual movie theaters simply to make no mistake about what the consumer is supposed to hear. I really do not appreciate this level of mis information coming from a professional audio publication. Please cut it out. Michael please go to school and learn what you are talking about. I love your writing and you have a ton of street level cred and knowledge but this subject has apparently been completely left out of your education with glaring omission.